Ceremonies may have all the tender moments, but receptions have all the fun — and amazing décor. While nuptials provide a hint at what's to come in regards to wedding style, the reception is really where your vision comes to life. From industrial venues and Tuscan-inspired settings to botanical beauty and vibrant details, we've rounded up some of the most breathtaking reception areas to get you inspired. Trust us — we could spend all day looking at them, and you will, too. A clear tent helps bring the outdoors indoors with a light and airy feel. 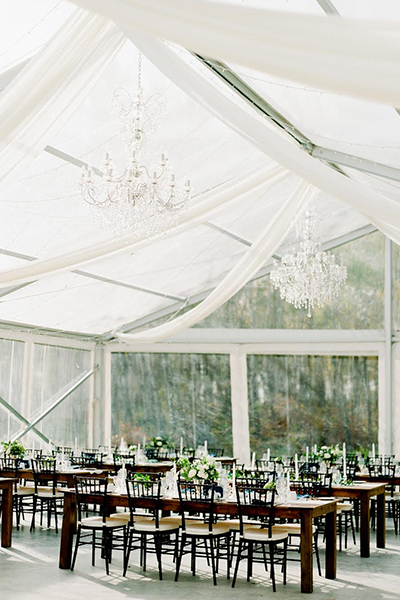 Crystal chandeliers and gauzy fabric cascading across the ceiling infuse a bit of elegance. Colorful and whimsical, this campside barnyard wedding is full of charm, complete with fairy lights, an Edison bulb chandelier, and pop of turquoise. A rustic forest-inspired look in a stone barn has an utterly enchanting effect. Copper accents, glowing candles, and an eccentric chandelier bring some cozy warmth to this industrial reception space. An intimate al fresco reception in a picturesque setting takes on European luxe, with foliage inspired by the country’s taste for terraces and gardens. Dripping greenery with hanging pendants makes for a dreamy overhang. Floor-to-ceiling plants are enough to fulfill any bride's botanical dreams. A venue overflowing with greenery makes a subtly beautiful statement. It doesn't take much to enhance the natural beauty of the beach — mix-and-match wooden chairs and tables and string lighting are all you need. A minimalist reception area with white linens and simple centerpieces magnifies the decadence of the surrounding outdoors. Grand, lavish, opulent — this gold space is fit for a princess bride. Ornate details channel romance and Marie Antoinette vibes. Exposed stones, succulent plants, and cactus accents combine against a white stucco venue for some desert feels. This magically glam reception area is full of bewitching details, taking some non-cliché inspiration from the Harry Potter series. Stone castle walls and overgrown botanicals are a dream backdrop to the moody romance laid out before it. Seriously, what's dreamier than a Bali cliffside reception? Geometric lanterns, lush greenery, and soft florals are the perfect complement to such a stunning setting. This surreal wedding reception of grays, pinks, and metallics transports one to another world, with modern, almost futuristic décor and one dramatic ceiling chandelier. A ceiling of thick foliage and twinkle lights has an alluring effect over neutral reception tables for some garden glam. Modern minimalism looks beautiful in the stark contrast of white details and dark wood, creating an intimate environment with a dinner-party style. Vivid jewel tones and surrounding lush greenery make for a reception that is bright, bold, and beautiful. Wooden rafters and a macramé backdrop have a bohemian rustic feel for a low-key reception. We love a U-shaped table layout, which makes this barn feel more open. An industrial factory setting gives this reception space a unique spin with brick walls and pillars. Its raw, weathered feel is cleverly juxtaposed with white tables and bold accents. Spanish-style décor adds complementary beauty to an outdoor ranch reception. Rich colors of cobalt, fuchsia, sapphire, and gold bring dramatic details and luxe romance. Gauzy linens and sparkling chandeliers bring a dash of glamour to a classic rustic barn setting with wooden details and baby's breath. Mismatched chairs add a punch of color and personality for an eclectic vibe. Whites, creams, and greens create a neutral color palette inspired by nature for a stunning reception that looks out at the bliss of the sea. A mesmerizing canopy of twinkling lights makes a statement in this rustic glam reception, setting a romantic ambiance while allowing the stars to shine through. Gold accents and towering centerpieces of lush greenery set the tone for a chic, modern, and sophisticated wedding. Beautiful long tables decorated in simplicity with green and gold, set against a villa backdrop, fulfills every Tuscan dream. Natural textures and earthy vibes combine for a rustically bohemian setting with a hint of glam. Dark woods, gilded accents, foliage, and an amber glow are completely swoonworthy. A tented reception has a backyard garden feel coupled with vintage vibes, thanks to a blend of greenery, trunk suitcases, and old-fashioned photobooth. Full of hillside charm, this reception is rich in simplicity. Centerpieces of fresh florals are all these round tables need to perk up. Blush linens and a dreamy ceiling of cascading fabric and greenery combine with stone walls for a fairytale effect. A white barn brings modern elegance to a typically rustic venue, evoking a light and spacious feel. And we can’t get enough of this amazing ceiling installation of hanging cherry blossom branches and glass bulbs. This whimsical outdoor reception is summertime fine, with bistro and icicle-like lighting interspersed with dangling dreamcatchers. Barren has never looked as beautiful as this reception set smack in the middle of the desert. Who needs décor when you have a rocky landscape around you as the perfect backdrop? Miniature succulent centerpieces add just the right touch. Multi-toned wood paneling boasting shelves of organics have a modern look that pops in rich decadence. Acrylic chairs and geometric pendant chandeliers bring a contemporary twist to an outdoor setting that screams old world romance. And just look at that picturesque mountain view! Jewel tones of raspberry and navy, coupled with gilded accents, lend this reception a chic, moody touch. Dark with romantic lighting, this gorgeous courtyard is set up for a family dinner party feel, complete with luscious greenery, a cozy faux fur blanket over the sweetheart chair, and charming cobblestones. A neutral and natural palette of white and lush foliage is all this stunning outdoor space needs. Set on a balcony framed with leafy pillars and a canopy, a naked table, runner, and bistro chairs come together for a café-like feel. A ceiling that twinkles like stars overlooks hanging florals in an industrial rustic table setting that comes alive with unexpected lime green and turquoise hues inspired by the Mediterranean. A ladder adorned with greenery and suspended glass globes make for a charming overhang in a French country-style wedding. Citrus details complement the surrounding desert landscape, combining for a Palm Springs-inspired look. Powder blue linens, garden florals, and a white tented canopy combine for a romantic outdoor reception that will stand the test of time. An open tent holds a gorgeous reception of casual elegance, mimicking the class and style of a Tuscan-inspired wedding. Sweet and feminine, this cheerful reception rife with delicate pastel details is just breathtaking. Cobalt blue bursts against a white and oak setting for a bold statement. Warm lighting and draped foliage set the mood for ethereal elegance. Coupled with a translucent tent that mirrors the night sky, this space is like a midsummer night's dream. A backdrop of soft Spanish moss is all this reception needs for some good old-fashioned Southern charm. Wooden tables and ceiling garlands of ribbon in this tented reception are playfully rustic, creating a bohemian campside atmosphere. Preppy meets whimsy with a striped runner and classic palette of white, gold, and navy combined with a unique reception set-up and eccentric chandeliers. Moody industrial romance is written all over this autumn set-up, marked by gorgeous blooms in shades of burgundy and deep orange and indigo hued crystal glasses to suspended Edison lightbulbs and marsala tapers.